The Big Game weekend’s almost here, with bonfire revelers at the Greek Theater scheduled to start torching at 7 p.m. tomorrow night. 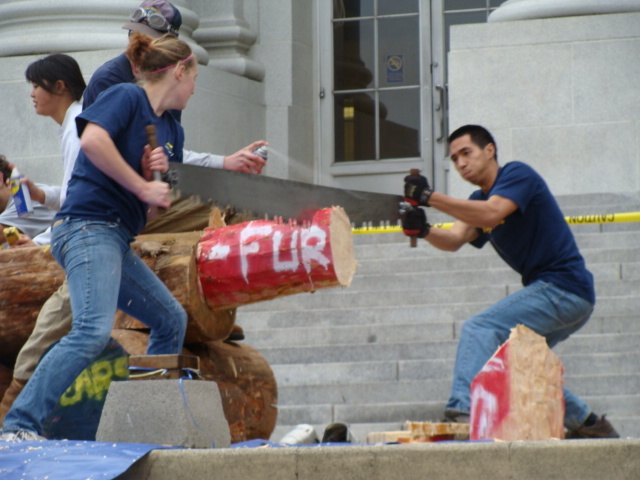 The UC Rally Committee–Berkeley’s oldest student organization and protector of thy holy university traditions since 1901–held a Stanford tree whackathon on Sproul Plaza yesterday, wherein they cut logs subtly painted over with blaring red Stanford logos to teensy pieces. Sledgehammer symbolism, anyone?